Happy Anniversary To Grouchy Puppy's Sharon & Cleo! 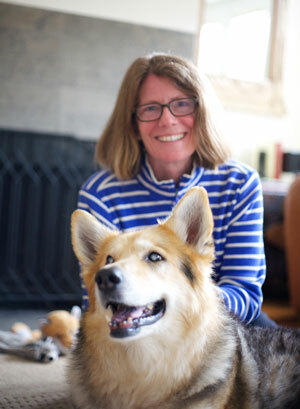 In honor of their big day of e-celebration on November 9th, Ocean Blue and I interviewed our favorite canine and human animal rescue marketing team, Sharon Castellanos and Cleo! Be a part of Cleo's Homecoming Day e-celebration on Facebook. You can also donate in honor of Cleo or the special animal friends in your life while benefiting Pets Are Wonderful Support (PAWS). Ok, on with our interview! Marie: Sharon, tell us about that day you decided you were going to adopt a dog. Did you have an idea of what your future dog would look like? Sharon: I grew up with Dobermans who were obedience trained, and had even won some dog show trophies. They were beautiful intelligent dogs. When we were ready to adopt, I knew I wanted my first dog to be smart and big too! It was after we bought our house here and settled in, my dream of finally having a big dog came true with Cleo. I had no idea after that what form he or she would come in and that made meeting Cleo all the more exciting. Marie: What was that moment like when you first laid eyes on Cleo? Sharon: Mesmerizing. I literally couldn't take my eyes off of her. She was in a room with another dog at the SF/SPCA adoption center. The other dog was barking and bouncing all over the place. Cleo stayed lying on the one bed staring at us. She didn't move or make a sound. We kept staring at her and then looking away. She had this aura of confidence, like she had nothing to proof. I felt like she knew how beautiful and special she was, as if we were the ones needing to convince her to let us adopt her. Marie: How did you choose her name? Sharon: We didn't, this is the name she came with. She was an owner surrender to a shelter up north before they contacted the SF/SPCA. In the beginning we accidentally called her Chloe, but she never responded. We laughed because as we got to know Cleo's personality it all made sense. Cleo is regal like Cleopatra, Queen of the Desert, plus there are times that she has cat-like features and curiosity. With that thick neck fur, I tell her that she looks like Elsa the lioness from Born Free. Marie: Tell us about one of your favorite moments with Cleo. Sharon: Probably one of my favorite moments was a few years ago at Fort Funston. It was a weirdly warm but foggy morning on the beach. We were alone and it was low tide. Cleo doesn't like to swim but she likes to walk into the water and bite it, or dunk her face in it. Cleo was chasing shore birds into the low surf, and I was checking out the exposed sea glass. All of a sudden during her jumping in the surf, she disappeared. Apparently there was a drop in the sand right past the waterline that you couldn't see. I had two seconds of panic before she bobbed back up like a cork, then she was racing over and shaking all the water off with the biggest happiest face. She was all dog in that moment. I loved experiencing that with her and knowing that I contributed to it by bringing her there that day. Marie: What is it like living with Cleo? Sharon: Over the past eight years it has been a roller coaster. At the start, we laughed that it was like we had a third roommate. She made a mess, burped and farted whenever and wherever. She listened when she wanted to. Then our relationship matured and she truly became my best buddy and a working member of the family. Now that she is older, it can seem at times that we're living with a baby dinosaur when she slowly lumbers from one end of the house to other, or we've a grouchy parent when she loudly groans when you tell her it's time to get up in the morning. I tell people that I live with a small pony and I'm her seeing eye buddy. Marie: Grouchy Puppy was born. Why this name? Why did you start it? Sharon: We came up with the name after hearing "that's a handsome dog, is he a wolf?" hundreds of times while out walking Cleo. We thought grouchy puppy accurately expressed her personality because she had puppy mannerisms yet also acted quite grouchy at times. We also noticed some people were afraid of her, and we thought it would be impossible to be afraid of a grouchy puppy. Grouchy Puppy was born as a way for me to use 21st century storytelling methods to educate people about important dog-centric topics, and universal topics like the importance of tolerance. When I began most of social media was only sharing sensationalized images and stories of dogs about to die, those who had been treated cruelly by man, or the dogs that had hurt or killed a person. I felt compelled to balance the negative stories and point of view about dogs with positive ones. Today I want to show people how the human-animal bond is demonstrated by both dogs and people. Marie: A few years after Grouchy Puppy’s name became known, you started to prominently advocate senior dog adoption. How did that come about? Sharon: I love all dogs. I believe they make us human. As Cleo became elderly, it squeezed my heart to read the numbers of senior dogs who are surrendered every month, and that they are also the least likely to be adopted. I believe that for many people, they would choose a senior dog if they only knew more. I love telling people how old Cleo is and how she's my first adopted dog. They see first hand how happy an old dog can be, and how much fun they are. Also since Cleo moved into her golden years, I've become much more empathetic to my own aging parents and their infirmities. 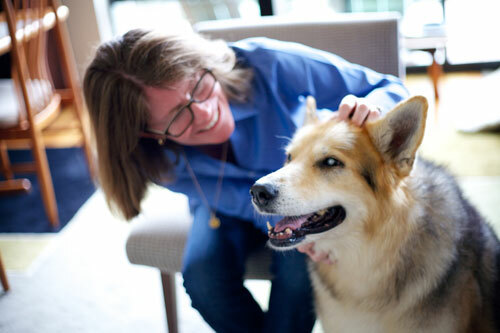 There are parallels between senior dogs and senior people that we can learn compassion from. Marie: How did you come up with this idea to throw on online party to celebrate your anniversary with Cleo? Sharon: The number eight is significant in many cultures and in science, and for a big dog who was already more than three when we met, that's a long life. Cleo has played a significant role in my life and over the years, positively influenced the lives of so many and I thought eight is the one to celebrate. ocean: cleo, what’s your story? how did you end up at the sfscpa? cleo: My owner surrendered me to a shelter in northern california when i was a few years old. No one knows why. The shelter folks saw right away that i had a winning personality and deserved another chance, and that maybe i was more a city girl. They called the sfspca who drove up and agreed. ocean: i like to work. and so does my mom. do you two like to work together too? cleo: Yes! we work together every day! I inspired my mom to create Grouchy Puppy! I'm what they call a muse. Four years I've been helping her write funny and educational stories, we collaborate on everything dog-centric! I love working with her because she learns something new because of me, and I reap the benefit of what she learned! Win-win. ocean: so i know you are senior like me. it’s pretty cool being a senior, isn’t it? what’s senior life like for you? cleo: You know, my life is good. My senior life includes some health issues like diabetes and blindness but because my mom and I work so closely together, they are just another pair of topics for her to learn about. She makes it so they never hold me back from enjoying our life together. Having arthritis isn't so bad either because my mom is constantly giving me massages. I also often get a treat after I successfully navigate my way down the hallway without bumping into anything! ocean: do you like vegetables? cleo: I do! My favorites are long green beans, peas and edamame. The long green beans are nice because they don't fall out of my mouth. I still love peas and edamame though and will eat them one at a time, like the lady I am. ocean: is life with your mom all that you could ever dream? It sure is and then some! My mom is attentive, and I think kind of worships me. She says I'm like a giant teddy bear that has come to life, she's always smelling my fur. I let her but usually when no one is watching. What is great is that my mom says I'm the perfect fit in the family, like I was a missing puzzle piece. I like that a lot. It means our lives together were meant to be. ocean: anything you have left to accomplish, cleo? cleo: I would love to help my mom reach her fundraising goal for Pets Are Wonderful Support. We know how much PAWS clients rely on them to help care for their animal companions. Seeing how much my mom relies on me for friendship and getting her out of the house, supporting PAWS mission is important to us. It's the same for our wanting also help Muttville. Both organizations focus on simple but oh-so important missions. ocean: it is so cool that your mom is having an online party to celebrate your anniversary together. what would you like to say to your mom on this wonderful day? cleo: I love my mom, and since we spend so much time together every day, I know she knows it. I would tell her 'thank you' for being as loyal to me as I am to her. I would tell her that she is smart for figuring out that dogs give fearlessly and not mercenary or slavish. I would tell her that after eight years together, I'm so glad that she loves big smart dogs! Congrats to Sharon and Cleo - 8 years together! If you feel like giving a gift in honor of the occasion, donations are always welcome on Sharon and Cleo's FirstGiving Fundraising page. Thank you to Cleo and Sharon for taking time to chat with A.R.M.! And CONGRATS on your wonderful anniversary!